Note: Those of you working on doghouse construction and/or independent projects will have time to continue to do so next week. Spend some time today researching and gathering information for your end task for this class. What can you make from a single 2×4, 8 feet in length? Using the skills and techniques developed over the course of this semester, you will design and create a functional item using a standard 8 foot long SPF 2×4. The general goal is to create an item that has more value than the 2×4 itself. Using online sources, search out potential project ideas. Create rough sketches of three to five potential projects on the attached page. Include notes and dimensions to help you determine the most suitable product. This is the time to consult with classmates and your teacher in order to select a project that is suited to your ability. Search for “2×4 challenge” to see some examples of things that other people have made out of a single 2×4. Remember that you can cut, rip, plane and laminate your 2×4 to create larger pieces of lumber. You could create another bandsaw box (or a few boxes, probably). You could glue up your 2×4 and create a CNC sign or plaque. You could glue up a blank and create something on a lathe. You could make a small shelf or stool. You could make a toy. The possibilities are literally endless! Collect your research it and save it in a document – you will be required to submit evidence of your research as a part of your final mark. Complete this third part of the tutorial process. When you have completed that, try part four. If you finish early there are other tutorials that you will see linked in the sidebar of the youtube page. Continue on to become a SketchUp master! Sketchup is a drawing and design program that is installed on the classroom computers. This tutorial will lead you through the setup process and will have you draw a basic house design. This second tutorial will have you draw a more advanced, detailed house. After you have completed the above tutorials, try drawing a house of your own. Can you draw your own home? This could be tricky if you live in an apartment building! Use sketchup to create a 3D model of your independent project. Sketchup is nice because it allows you to fully visualize a design before you build it. DHS has the opportunity to enter a safety contest and win an awesome new bandsaw for the wood shop. In order to win the contest we need to get a very high score on an online quiz. Only one entry is allowed per class. Before we submit an entry we need to research the answers and make sure that we get close to perfect on the test. The quiz is here: http://machinesafetyservices.ca/school-shop-safety-contest/ Please read and research the questions to determine what the correct answer is but DO NOT SUBMIT THE ANSWERS! We will have to pick a “class representative” to submit the quiz on our behalf and we will do that before the deadline. When I return tomorrow we will continue working on the picnic table project. Don’t worry, I have not forgotten about the dog house project (I know you were worried). If you finish the above, do a google search for “single sheet doghouse” – are any of these plans usable for our needs? I want a doghouse that is framed similarly to the house framing exercise that you did yesterday so we may have to do some modifications. 1. The frame of a house can be compared to what part of the human body? 2. What determines the size of the framing parts of a house? 3. Why is it important to have knowledge of house components, especially when remodeling? 4. How can non-bearing walls be identified in house construction? Why is it that they are safe to remove when remodeling? 5. Why is the footing wider than the foundation? 6. What are the two basic framing methods? Which one is more common in new construction? 7. Briefly describe the platform framing process. 8. What are the two standard spacing measurements for wall studs? What is one reason that those spacings are used? 9. What is the purpose of exterior wall sheathing? 10. What materials are generally used for roof sheating? 11. What purpose does inner wood framing serve? 12. Why would 2×6 lumber be used for inner wall framing? 13. Provide a short description of the components of window opening framing. 14. What are some advantages of raised floors over slab floors? 15. What are the typical sizes of floor joists? Take a look at http://www.careersintrades.ca/. What are some of the steps that you must take in order to enter into a skilled trade? What are the options available for people who would like to do this? How do you find an employer when you are interested in entering a trade? The construction industry is generally divided into sectors such as residential, industrial, commercial, institutional, civil and repair/maintenance. Check out this link that contains descriptions of various construction sectors. Select one sector (click through the links until you get to a final description) and provide a brief summary of the work that is done in that sector. See if you can find pictures online of some projects that have been completed in that sector. Submit your completed work to me via email. Take a look at the list of Learning Skills and Work Habits listed below. Describe each of the learning skills in your own words, and list an example ot two of how you feel you meet or don’t meet the requirements of that Learning Skill. (for example Responsibility: A responsible person has good attendance, arrives to class on time and completes their course work on time. I am responsible because I try very hard to have perfect attendance and I use my time well to complete my assignments on time.) Submit via email. gather, evaluate and use information, technology and resources to complete tasks. follow instruction with minimal supervision. share information, resources, and expertise to solve problems and make decisions. recognize and advocate appropriately for the rights of self and others. b. Sometimes, it’s all about estimating. Try your hand at the estimating game here. Can you get the lowest (best) score? I received just three emails with completed work yesterday – please complete the Workplace Health and Safety reading and email me your results. Take some time to check other past assignments as well – email anything that you have not yet submitted. When you have completed your Vcarve please sign your name on the list that is taped to my desk – this will be the order that we produce the items. By the way, you need to check out the www.woodgears.ca site that I found the estimating game on. The site is created by a super detail-oriented woodworking guy who obsessively documents his projects. I like his machines and contraptions. Among other things you will begin work on a new CNC V-Carve project. If you have not used V-Carve before, here are a few links to tutorials: Youtube and text version. You will create a V-Carve sign that has a “cut-out” shape – not a simple square or rectangle, but a shape that follows the outline of the sign (like this: example 1, example 2, example 3). You can also make a sign that has a frame such as the one on the right in example 1. Dimensions will be 12×18 (unless you have a special requirement for something larger). Start by deciding on a graphic or image for you sign and begin experimentation with V-Carve. Machine time is limited so we will be producing these over the next few weeks while we also work on other projects. You may already have a part time job or hope to get one, and it is likely that you will eventually finish school and enter the workforce. It is important as an employee to know what your rights and responsibilities are regarding workplace health and safety. Read the following and create a brief summary of the information, focusing on the three rights of workers. Why do you think that those rights are important? Can you think of an example when a worker might use one or more of those rights? If you are currently employed, did your employer make you aware of the rights that you have? The right to know about hazards in their work and get information, supervision and instruction to protect their health and safety on the job. The right to participate in identifying and solving health and safety problems or through a health and safety representative or worker member of a joint health and safety committee. The right to refuse work that they believe is dangerous to their health and safety or that of any other worker in the workplace. Workers have the right to know about any potential hazards to which they may be exposed in the workplace. The primary way that workers can become aware of hazards in the workplace is to be informed and instructed on how to protect their health and safety, including health and safety related to the use of machinery, equipment, working conditions, processes and hazardous substances. Information about the hazards in the work they are doing. Training to do the work in a healthy and safe way. Competent supervision to stay healthy and safe. Workers have the right to be part of the process of identifying and resolving workplace health and safety concerns. This right is expressed through worker membership on joint health and safety committees or through worker health and safety representatives. Workers have the right to refuse work that they believe is dangerous to either their own health and safety or that of another worker in the workplace. For example, workers may refuse work if they believe their health and safety is endangered by any equipment they are to use or by the physical conditions of the workplace. Section 43 of the Act describes the exact process for refusing work and the responsibilities of the employer/supervisor in responding to such a refusal. In certain circumstances, members of a joint health and safety committee who are “certified” have the right to stop work that is dangerous to any worker. Sections 45 – 47 of the Act sets out these circumstances and how the right to stop work can be exercised. UPDATED: If you are one of the few who have finished this assignment, jump to the bottom for something new. In times of energy conservation and resource scarcity, increasing attention is paid to the energy-efficiency of the buildings and structures that we live and work in. 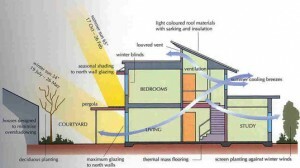 Many methods have been developed to increase the energy-efficiency and comfort of the home that we live in. The following are just some of the methods and techniques used to improve the energy efficiency of modern buildings (some of you may even live in homes that utilize these methods): ground-source heating and cooling, improved insulation, building-envelope systems, technologies to reduce light and noise pollution, energy-conserving lighting, non-toxic building materials, use of local materials. Although this work may not seem fully connected to our “hands-on” course work, it is a part of the course curriculum and this work that you do will be included in your final grade. Select one of the methods listed above and create an informational page including pictures or graphics. Building Sciences (http://www.buildingscience.com/index_html) is a leader in research and development of energy-efficient building design – you may find some useful information on their site. Include all of this information on a single page. Try to use Canadian sources for your information. Please include links to your sources. Email me the completed project.